On the last Friday of every month we have dress down Friday. On this day staff come to work in their own clothes and donate some money to charity. At the end of the year we divide the money between our chosen charities. Children in need. Nov 18. We raised lots of money (£50) by selling raffle tickets to win a meat hamper, and a guess the weight of the cake and a guess the number of sweets in the jar. Thank you so much to all the patients and staff for buying a ticket. Thank you to Dr Gor for making the fruit cake and Julie S (Receptionist and Admin) for the fantastic Pudsey decoration.Thank you to Julia (reception and Admin) for donating the meat. Thank you to Julie S for donating the sweet jar. This year our 2 chosen charities are Reubens Retreat and Mummys Star. Both these local charities have personal meaning to staff at Chadsfield Medical Practice. If you would like more information on either of these charities you can ask at reception of follow the link above. Chadsfield would like to say a big THANK YOU to one of our wonderful reception staff - Julia - for organising us all and sorting out all the fundraising events that are detailed below. Chadsfield fund raises for other causes along the way - here are just a few of our activities such as cake sales and other fundraising events. 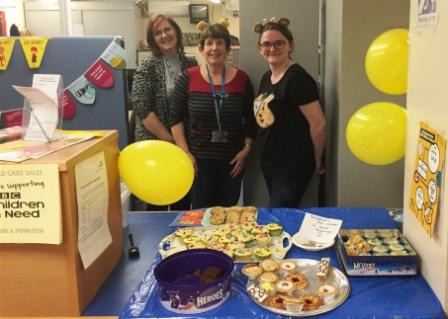 Chadsfield sold cakes and biscuits to raise funds for Children in Need - we raised £71.15 - thank you to all those involved. £85 was raised on Children in Need Day. 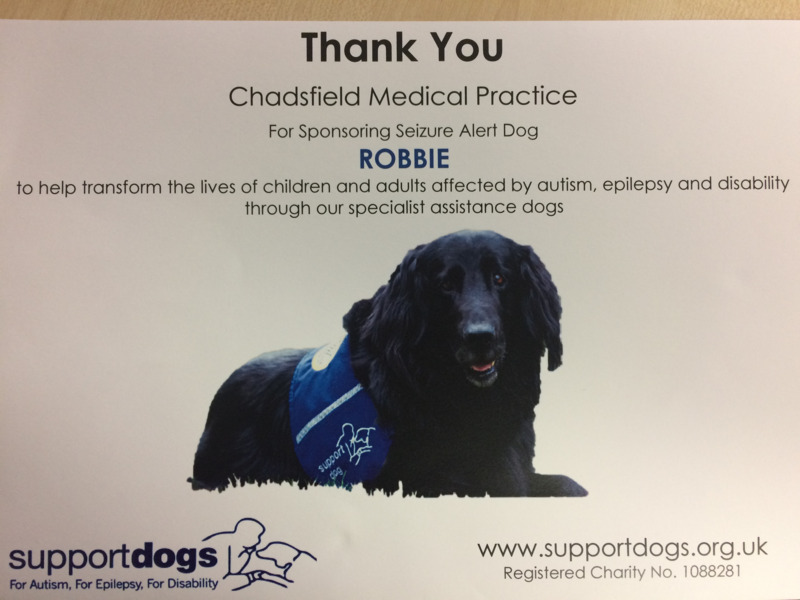 Chadsfield Medical Practice is proud to be a sponsor of a 'Seizure Alert Dog' - Robbie. Seizure alert dogs can transform the lives of people with eplipesy. 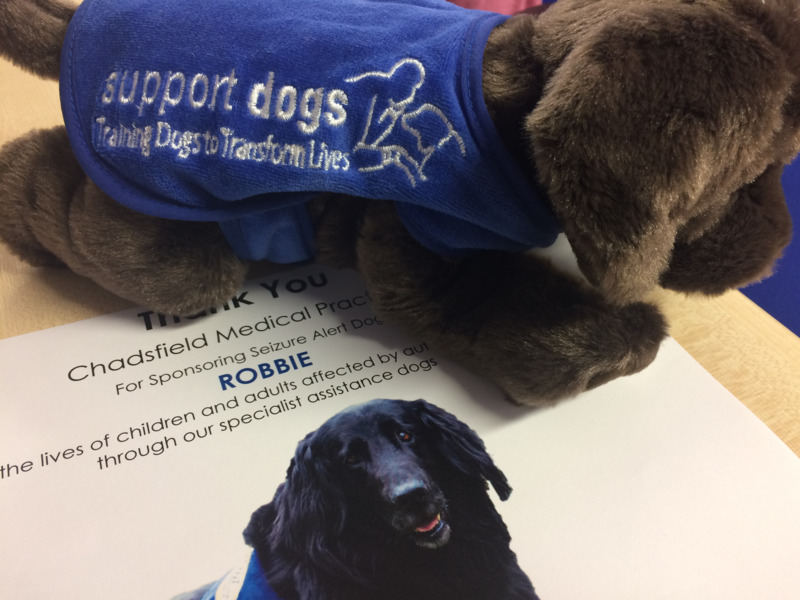 The 'real ' Robbie lives at home in Sheffield with a person suffering from epilepsy, able to detect a seizure approximately 45 minutes before one occurs, enabling them to get to a place of safety and get assistance if required. The 'fluffy' Robbie pictured here is cared for by the children of our Advanced Practitioner, Cath Pierce.